OneRiot, the real-time search engine, has signed a deal with MySpace which allows content from the site to be made available through search results. This means that if anyone using MySpace posts a link to a breaking news story or something interesting on the web, OneRiot will make that content available immediately through its website. The link-up strengthens OneRiot's real-time search algorithm, which already indexes information from its own panel of 3 million users as well as Twitter and Digg. Real-time search is certainly big business at the moment, with search giant Google announcing it has also launched in this burgeoning area. Google is also one of the partners to take on MySpace's real-time feed. "MySpace users are making a huge contribution to the real-time, social web by sharing millions of links with their friends each day," explained Tobias Peggs of OneRiot. "We're delighted to have access to that information through the MySpace Real-Time Stream API. 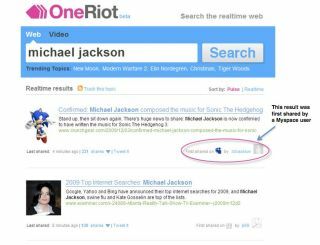 Ultimately this improves the relevance of OneRiot's search results – especially for music and video content – further helping our users find the freshest information on the web right now, for any topic." If you haven't tried out OneRiot, check it out now at www.oneriot.com to see just what's the zeitgeist. Currently it seems, unsurprisingly, that Tiger Woods and Christmas are search terms of the moment.